Received a file and can’t open it because you don’t have a software for it? Next time head straight to OpenWith.org. 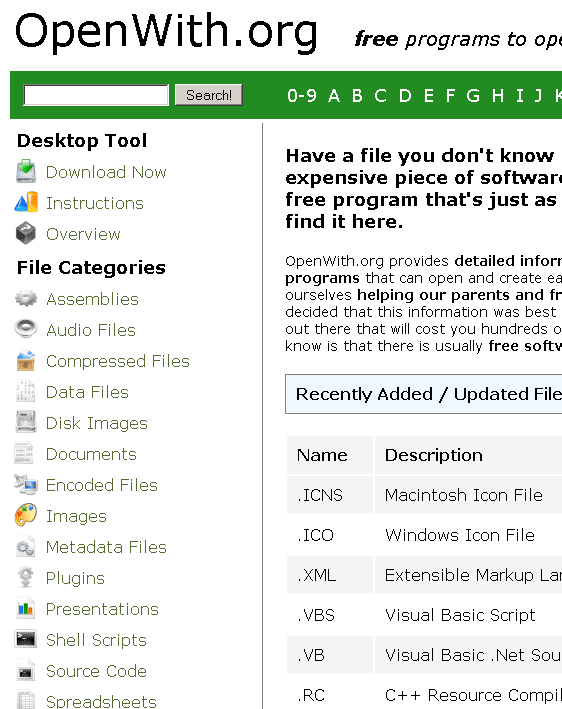 This handy website lists free software programs to open any file extension you need. Programs are grouped according to file types like images, audio files, spreadsheets, videos and so on. Just search for the right program using the file extension name. Next, download the program on to your computer and open the file. Helps to open almost any file extension for free. Lists lots of freeware programs to open any file files. Search for particular program or browse alphabetically. Download the program or get it from software developers’ website. You may also check out OpenItOnline, a browser tool that can open certian documents, images and other file types without the need to download and install a software for it. March 12, 2009 by Ben Pike.